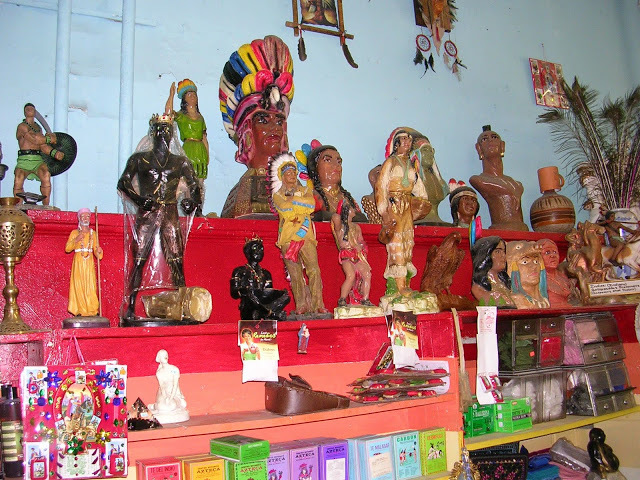 The botanicas in Humboldt Park represent a diverse blend of religious spiritualism and folk medicine hailing from countries such as Puerto Rico and Mexico. 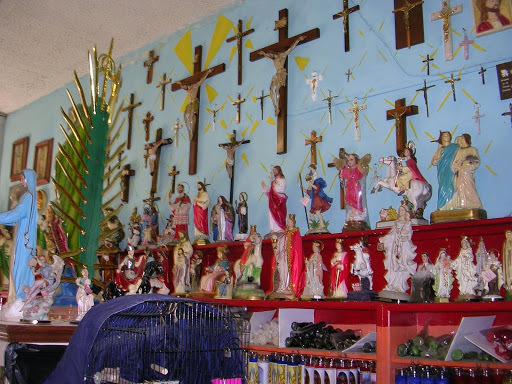 The most abundant religious referents are Catholic, especially Mexican Catholic, but also Interfaith: Buddhas, Santeria, and even Hindu deities. 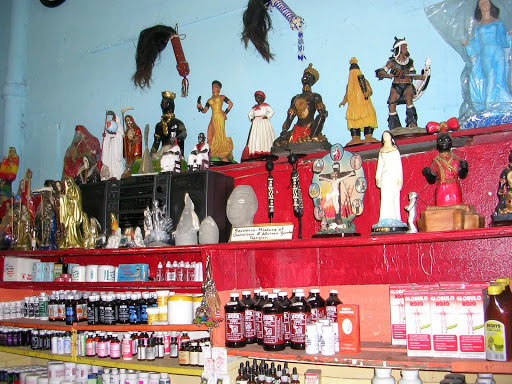 Stepping into a botanica, one notices a vast collection of figurines, votive candles, incense, soaps, and containers of herbs. Candles are commonly divided into candles that already have a prayer and saint depicted, and blank candles which patrons can have a saint and prayer dedicated through a ceremony conducted by the owner. Most botanicas seem to reach a wide audience through word of mouth rather than through dedicated advertising. Botanical Olocun Herb’s candles, oils, and soaps all have herbs in them. The candles they sell are each connected to a specific spirit, and burning one allows one to call a certain spirit. Some common remedies given by the store owner included marjoram (mejorana), rosemary, and wormseed (apasote) boiled with one clove of garlic make a tea that is good for stomach aches. She recommends sage (salvia) for diabetes, and linden flower for stress, and eucalyptus mixed with oregano for bronchitis. Botanical Olocun Herb gets their products mostly from Mexico and Florida, and some come from California and Texas. While still selling what are commonly thought to be “traditional” or “folk” products, such establishments, beliefs, and practices are not untouched by the reach of the global market. A television plays in Centro Botanico Guadalupano in Pilsen. Similar to stores in Chinatown and Devon Avenue, televisions were on the entire time, during all site visits. At the botanica, it was tuned to Spanish-language programming of professional sports, primarily futbol. The televisions were audible, and thus provided sonic sensations in addition to viewing experiences. This infusion of non-English-language in immigrant space should be viewed in the context of heightened nativist sentiment nationally. It is an example of the ways in which cities may continue to be important sites of immigrant safety and activism in the face of increasing anti-migrant violence in some suburban regions (including the “collar counties” surrounding Cook), small towns, and U.S.-Mexican border areas. The televisions also bring the domestic into the retail, thus fusing the two spaces and creating a different kind of “public." This fusion might also be viewed as relating to a particular view of health: one that understands home and commerce to be in relationship — a relationship that is necessary to achieve health and wellbeing.